Located in charming St. Johns County, Markland is truly a community built for families of all sizes. 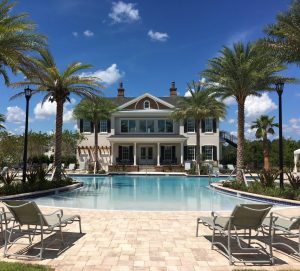 This stunning Florida oasis features a clubhouse called The Manor House, where you can do all of the activities that you love at any time of the year. Here, you have a convenient location to employment centers and recreation, as well as the greatest amenities waiting for you! With gatehouse staff at entry, you and your family will always feel safe and sound. Make a splash or relax in the resort pool with a luxurious cabana, workout in the spacious fitness center with aerobic/spin/yoga studios, partake in a little friendly competition with your friends on the tennis and pickleball courts, and unwind near the scenic 15-acre lake, event lawns, and parks all around you. A close proximity to the interstate conveniently provides you with the ability to travel anywhere you want to go. Whether it be your children’s school or your place of employment, Markland is a peaceful, private community located near all of your destinations. Providence Homes is proud to say that every home we’re offering in this community is 100% ENER GY STAR® Certified, which means that you’ll always be comfortable in your home while you save money on your utility bill. We have homes ranging from $400-$600K, making it easier for you to choose the perfect size for you and your family. With our many quick move-in homes as well as 8 model homes, you can start the greatest journey of your life as soon as you wish to! The memories you and your family will make in your Providence home will be cherished forever. For more information on our Markland community, please visit our website, or give us a call at 904-337-5236. We look forward to working with you!